ALL SHE WANTED WAS A PLACE TO CALL HOME - f****or fans of Katie Flynn and Dilly Court, The Gingerbread Girl is a heart-warming novel that's perfect for cold winter nights. Ill and stuck in hospital over Christmas, seven year old Cora Kelly is excited to receive a visit from her mother, who brings her the gift of a gingerbread man. But little does Cora know that this will be the last time she sees her . . .
Will Cora be able to escape the inevitable, or is she destined to repeat her parents' mistakes? 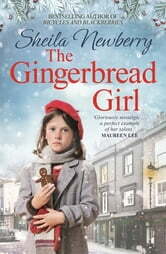 i enjoyed this book The Gingerbread Girl, the 1st time I have read anything by this author and I liked her style. The only thing I would say it seemed to end so abruptly. Oh how I enjoyed this book. The characters, the ups and downs they faced. I felt I knew every one of them. Will definitely look for more from this author. Thoroughly enjoyed the story. I liked meeting all the characters. Very interesting reading have now read a couple of this authors books and have thoroughly enjoyed them am now going to purchase more.